I've said before that I love Amy's Gibson's blog, StitcheryDickoryDock. 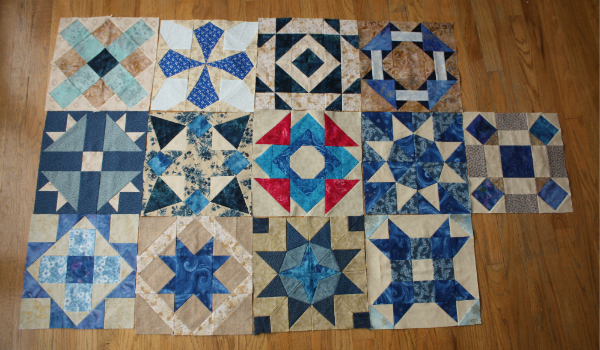 I joined in with her Sugar Block Club BOM back in 2013 and made all the blocks, but I didn't get any farther with the quilt after the year ended. So, when she started up the SBC again this year, I decided I'd make this year's blocks, add them to the blocks from 2013, and make myself one big quilt. 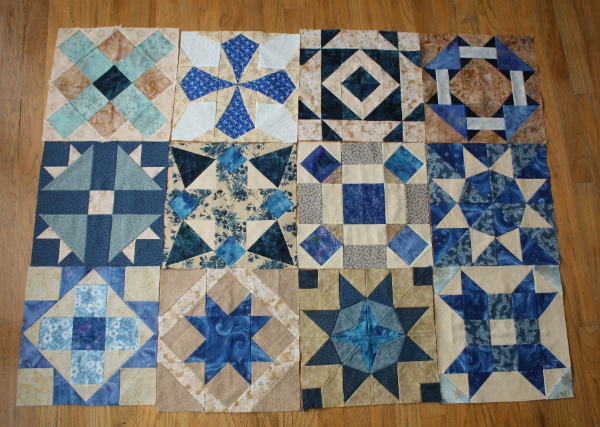 To begin with, I pulled out the old blocks and laid them out. While I love the blue and beige/cream blocks, the collection seemed to be lacking something. They just seemed a little bland. So, I started digging around in my trunk of fabric to see what I have that might add a pop of colour. I found a bunch of nice, bright pinks so I scattered those over the blocks and I really liked how they looked. This is why I love having a stash of fabric ready and waiting! With my new colour scheme in place (blue and beige/cream with pops of pink), I made the January block - an updated Churn Dash. 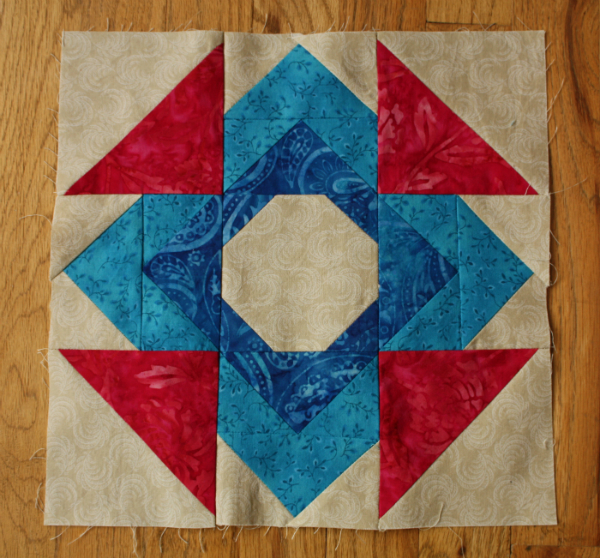 What a fun version of a classic block! Here are all my blocks together. That pink adds exactly the pop I wanted! I'm excited to see what blocks are added over the rest of the year. Linking up with WIP Wedsnesday. I love this new sugar block and the addition of that colour pop is perfect! This going to look fantastic! The addition of red is perfect. All the blocks will be beautiful together. Aren't you glad you waited? The pink will be great to move your eye around the quilt. I love the updated churn dash with the snowball in the middle. I like that updated Churn Dash. And wow...that pop of pink makes a huge difference. Love the block and that added color is amazing. I combined the first two sugar block clubs (2013 and 2014) and made one big quilt top. I added one extra block so it would be 5X5. When she started this years club I realized it had been a whole year and I hadn't quilted it yet! Working on it this week! Wow! The pop of pink adds a lot. Great choice.